Summary: Complaint should be Jung Changmin's middle name. 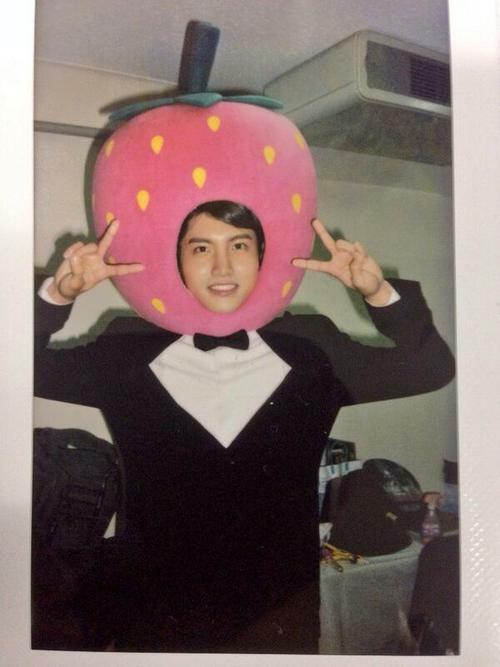 Jaejoong ignores the complaining strawberry as he walks around the room hunting for the missing orange and apple. The gorgeous man continues on blithely, ignoring the nine year old as he looks for his twins. “Did you put them there?” Jaejoong turns to cast a suspicious eye over his pouting son. He has to school his features because dear lord the boy is a right picture with his pink strawberry head. “Apples and oranges belong in the pantry.” Changmin sniffs superiorly. “Jung Changmin…” Jaejoong shakes his head as he hurries to the walk in pantry. He barely has the door open before twin giggles filter out, and he finds his daughters exactly where their brother left them. An apple and an orange. Yunho walks in just then, looking over his wife and son’s shoulder to stare at the grinning babies with their cute apple and orange outfits. They are both surrounded by spilled fruit, Mimi gnawing innocently on a large orange as she stares at her parents. Nana is staring at a shiny red apple with wonder on her face. Who knows what’s going through her baby mind. “Do you think that counts as cannabalism?” Changmin asks curiously as he watches his baby sister wave the orange at him before she tosses it out of the basket and grabs another. “Do I even want to know how they got there in the first place?” Yunho eyes his 10 month old twins looking none the worst for wear. To be fair, this isn’t the worst he’s seen. He remembers one year when Jiyool decided that Changmin was so stinky that he must be rubbish and she lugged him to the trash in her toy wagon. He shudders at the memory, thanking the stars to this day that trash day had been the day before, and the rubbish area is sheltered. He couldn’t even really scold Jiyool for it, for her five year old logic had been sound. Changmin really was a stinky baby that week thanks to the durian Jaejoong had eaten that passed through his milk. “I already know why,” Changmin mumbles as he tugs at the ridiculous head gear. Yunho’s brow furrows as he stares at his pouting son, fully aware of his wife vibrating with suppressed laughter next to him. Yunho blinks at his irritated son in his tuxedo and the pink strawberry head. That’s all it takes for the Jung himself to burst out laughing, shocking his little fruit, but the two are familiar with their daddy’s sharp laughter and they gurgle along with him, wiggling in their parents’ arms. His laughter gets even louder as he watches an extremely huffy strawberry storm out of the kitchen, his pink head bobbing with each step. Jaejoong settles himself next to Yunho, staring at the court, his eyes searching for his sons. The basketball games progresses as basketball games go. The action is swift and the crowd, loud. Everything is going smoothly until one of the boys from the other team gets a little too exuberant in marking Yoochun. “What the heck was that! ?” Changmin’s extremely carrying voice reaches his parents. Not to mention the rest of the crowd. Several grins break across the faces of the audience, for this tall, lanky boy, the youngest on both teams has been complaining almost non-stop since the game started. At first it seems like he’s being unsportsmanlike, but after a while, most realize it’s just his nature to complain, for they are never limited to him. He complained about the ball at the start. And then he complained about the lights. Just to add to all that, he decides to complain about the color of his own team’s jerseys, wondering why they’re wearing white instead of red. When the game actually starts, he complains about the three pointers the other team keeps scoring, saying it’s not very basketball-like to not even bounce the ball. And then he complains about giving away two free throws, arguing with the referee that it really should only be one since their team is already handicapped being smaller and younger. Following that is a rather energetic debate in the middle of the court about how free throws ought to be thrown, Changmin complaining that his team’s coach didn’t teach them properly since the other team always sinks their free throws and they don’t. The crowd starts laughing at the indignant teen, waving his arms madly as he goes up against the mutt, glaring at the smirking older boy who walks away from the belligerent boy. “You say that now,” Changmin grumbles. The game restarts amidst the bickering, Yunho and Jaejoong can both see the poor ref shaking his head exasperatedly at the complaining teenager. They are rather amused to find that “Juil” has switched marks though, and is now shadowing their youngest. Two minutes of event free basketball, and it happens. Jaejoong covers his mouth, trying to suppress his laughter as his son once again makes a spectacle of himself. He can see the older twin keeping his distance from the chaos, Yoochun rolling his eyes in their direction when he catches his parents’ eyes. He is torn between horror and hilarity as his tall thirteen year old actually re-enacts the alleged foul on the referee himself, his hands slapping at the man’s shoulders trying to prove his point. “I think I’d have thrown him out of the game myself,” Jaejoong admits. “I would’ve benched him within the first five minutes.” Yunho agrees as the game resumes once again. Another two minutes go by. “Thank god!” The ref declares loudly, throwing his arms up to raucous applause and cheers. Yunho and Jaejoong among them. I'm a new reader of this whole fic and i really like this story..actually i just finished reading the whole story + drabble and i found out that you update..
Changmin is just so changmin! He makes me laugh all the way to the end..